Veterinary experience with the use of transoesophageal echocardiography (TOE) has continued to rapidly grow since it was first described in dogs and cats in the 1990s. It is performed using a specialised phased array ultrasound transducer that is positioned via a flexible endoscope. The TOE probe can therefore be moved cranially and caudally, rotated clockwise and counter clockwise and the tip can be flexed to a maximum of 90o ventrally (anteflexion) or dorsally (retroflexion) within the oesophagus. In addition to these manipulations, the phased array transducer itself can be rotated through 0 to 180o whilst keeping the endoscope position static, to align the ultrasound beam through transverse and longitudinal imaging planes. The position of the oesophagus in relation to the heart base provides an excellent acoustic window for echocardiography, without interference from the lungs or the ribs/sternum (Fig 1). This is particularly helpful when there are thoracic wall abnormalities or lung changes that interfere with transthoracic echocardiography (TTE) imaging planes. One of the most frequent indications for TOE is the assessment of congenital heart disease as imaging from this position often provides superior imaging when compared with TTE, allowing detailed inspection of cardiac anatomy and function. TOE is particularly useful alongside conventional fluoroscopic techniques during interventional catheterisation procedures as it provides a real-time, direct assessment of the heart to guide catheters or devices within the heart and to measure blood flow velocity, e.g. before and after balloon valvuloplasty of the pulmonic valve. This is helpful to minimise the fluoroscopy (and potentially procedural) time and the dose contrast agent necessary during angiography. Using TOE rather than TTE has the additional benefit that it allows the operator to be positioned away from the fluoroscopy beam during the procedure. Figure 1: Angiographic image from a dog with valvular pulmonic stenosis following injection of contrast from a Berman catheter placed within the right ventricle (RV). Note the close relationship of the transoesophageal echocardiography probe (TOE) with the heart base allowing excellent visualisation of the pulmonic artery (PA) and associated structures. At SCVS we perform minimally invasive (interventional catheterisation) procedures to diagnose and treat a wide range of conditions, the most common of which are congenital abnormalities e.g. patent ductus arteriosus or pulmonic stenosis. The use of TOE during these procedures adds to the existing advanced imaging modalities (including ECG-gated computer tomography) available at our centre. A five-year-old female neutered Bichon Frise was presented to SCVS with a history of a murmur that was detected incidentally during routine physical examination at her new vet practice. Her owners considered her to be asymptomatic, with excellent exercising ability and normal respiration at home. Physical examination at SCVS confirmed the presence of a grade V/VI left basilar, continuous murmur and hyperdynamic peripheral pulse quality. Transthoracic echocardiography demonstrated the presence of an abnormal communication resulting in continuous blood flow from the descending aorta to the pulmonary artery. The morphlology and position of the communicating vessel was consistent with a type IIB patent ductus arteriosus (PDA). The left ventricle appeared moderately volume loaded, with hyperdynamic left ventricular wall motion and the recommendation was made to close the PDA via interventional catheterisation. A variety of devices and methods may be considered to occlude PDAs using minimally invasive techniques. The ultimate decision regarding the most suitable device and technique to use is based on a number of factors including the patient body size and the size and morphology of the PDA. Much of this information is obtained during the initial TTE assessment. In this dog the Amplatz vascular plug II (Fig 2) was selected to be placed via femoral venous puncture. Transvenous techniques have the benefit that they negate the need for surgical vascular access and the subsequent sacrifice (ligation) of the femoral artery that is required for transarterial approaches. 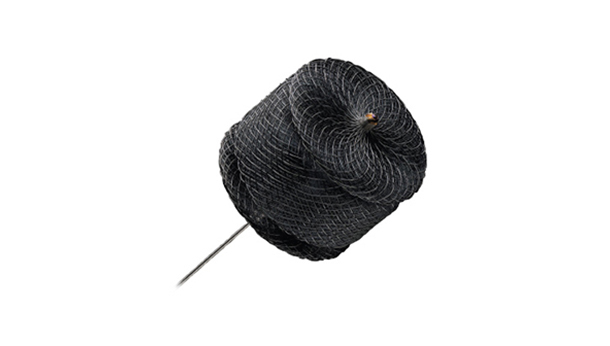 During PDA occlusion a combination of angiography and TOE was used to assess PDA morphology and size and to guide the passage of catheters through the heart. Careful imaging was mandatory to accurately select the correct size of device to occlude the PDA and to avoid it becoming dislodged into the pulmonary or systemic circulation following release. The size of the device that was selected was based on measurements of the main body (ampulla) and ostium of the PDA (fig 3). 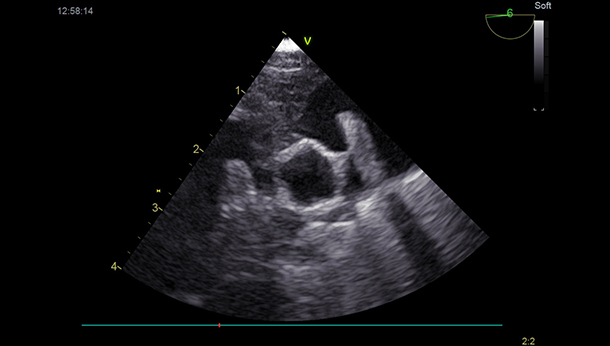 Figure 3: A. Transoesophageal echocardiographic image of a patent ductus arterious (PDA): Ao = Aorta, Pa = Pulmonary artery, * ostium. # ampulla. B. Colour flow Doppler showing left to right flow through the PDA. The occlusion device was delivered by a catheter placed via the femoral vein into the right side of the heart and pulmonary artery to a position within the PDA. The device was then deployed from the catheter, so that the proximal disc and main body of the device was within the ampulla of the PDA and the final disc was positioned within the pulmonary artery (fig 4). 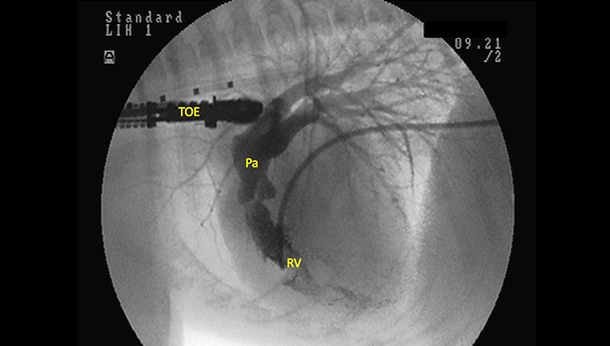 Figure 4: Transoesophageal echocardiographic image showing an Amplazer Vascular Plug II positioned across the PDA. 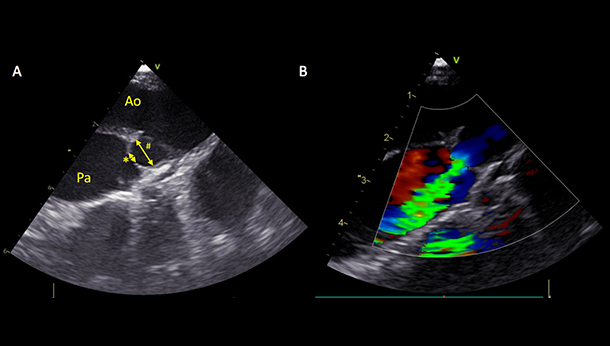 In this dog, direct cardiac visualisation using the TOE provided confirmation that the device was correctly deployed prior to release from its delivery system and that there was complete occlusion of the PDA following release of the AVP II device, with no evidence of residual flow using colour flow Doppler. The dog was hospitalised overnight following the procedure and was discharged the following morning. We are pleased to report that she has recovered well from her procedure and we look forwards to reassessing her towards the end of this month.